Figure 7-6. - Root canal broach with enlarged view. Figure 7-7. - Reamer with enlarged view. Figure 7-8. - K-type file with enlarged view. Figure 7-10. - Gates-Glidden drills. 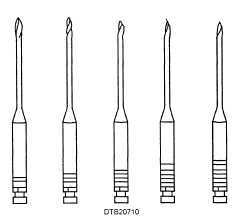 Gates-Glidden drills (fig. 7-10) are designed to enlarge the root canal. They are designed with long flame-shaped shanks. As a rotary cutting instrument, they call be used with a slow-speed contra-angle and with friction-grip straight handpieces. The number of bands at the base of the drill indicates the size of the drill. Their sizes are numbered 1-6. Size #1 is fragile and therefore rarely used to avoid the possibility of breaking off inside the canal. Figure 7-9. - H-type file with enlarged view. The lentulo spiral (fig. 7-11) is designed to transport cement or paste to the finished root canal before the placement of the gutta-percha master cone. It is used with a latch-type handpiece and is small and flexible in design. 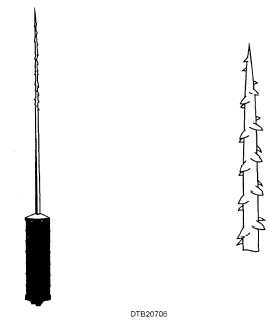 There are two types of endodontic condensers. The first type is referred to as a plugger or vertical condenser. The working end is contra-angled, and cylinder-shaped with a flat tip designed to condense root canal filling materials vertically into prepared root canals. The plugger shown in figure 7-12, has serrations at 5-mm intervals to evaluate penetration depth. Figure 7-11. - Lentulo spiral. Figure 7-12. - Root canal plugger or vertical condenser.